Ultra Surefire have recently become an approved member of Construction Line, the UK’s largest pre-qualification scheme, owned by the government. 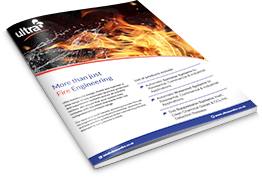 Every improvement in fire protection systems is of vital importance, because this is a technology that can save lives. Fortunately, fire safety equipment is becoming increasingly sophisticated and effective at rapidly detecting, containing, extinguishing and suppressing fires. Most importantly, new technology is creating more time to evacuate people at risk from buildings. Published in draft format back in 2010, British Standards for water mist systems have been used by specifiers and consultants to set a benchmark of performance criteria for both design and installation. The new Bloc Hotel recently opened at Gatwick Airport is incredibly innovative in the way it has been designed and built, as well as offering guests the height of luxury, convenience and high tech resources. It has also offered the opportunity for Ultra Surefire to undertake an extensive installation of a water mist system with unique features and challenges. At 16.25 hours Derbyshire Fire & Rescue Service was called to an address in Long Eaton following a report of a portable misting system activating. Firefighters from Long Eaton responded to the call and on arrival confirmed that a portable misting system had activated and extinguished a small bin fire. The occupant of the property was taken to hospital for precautionary checks. A glittering awards ceremony took place in Hessle, where Humberside Fire & Rescue Service celebrate member of staff and the public for their contributions to the community and acts of courage. On the evening of Friday 26th October 2012 Northamptonshire Fire and Rescue Service (NFRS) were called to a house fire in Wellingborough. The house was occupied by an 86 year old known to be immobile and a heavy smoker. After investigation, the supposed cause of the fire was accidental by discarded smoking materials which ignited newspaper adjacent to the resident’s chair in the living/sleeping accommodation. – A new sprinkler system saved the life of a Hull pensioner – Article from the Hull Daily Mail. VULNERABLE smokers in Hull are having sprinkler systems fitted in their homes to give them greater protection from fire. Humberside Fire and Rescue Service has joined forces with other organisations for the partnership project, which is the first of its kind in the country.